Real Housewives of Atlanta Recap: Nene Lashes Out at Tanya and Porsha Announces Her Pregnancy! The people of Japan may never be the same! 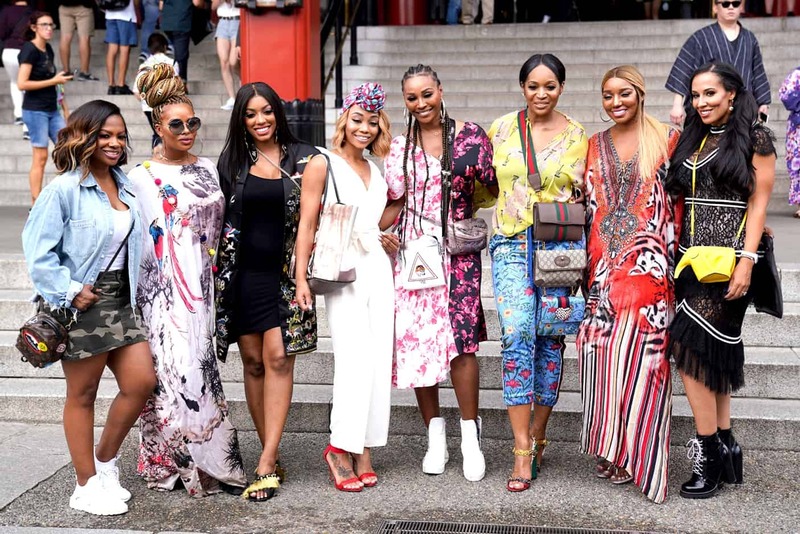 The ladies of The Real Housewives of Atlanta touched down in Tokyo on last night’s episode, and they brought all their drama–and all their hair… along for the trip. When we picked up with the ladies, they were preparing for their big Japanese adventure and tying up some loose ends at home. Kandi was planning a new event – this one with a dungeon theme. Eva stopped by for a visit and told Kandi how upset she still was with Porsha for calling her out for her low key shadiness at the hibachi night last week. Kandi, of course, is all too familiar with Porsha’s handy work and told Eva that she needed to address the issue with Porsha before things went from bad to worse. At the same time, though, she couldn’t help but agree with Porsha’s overall sentiment. Eva does have a tendency to shade people behind their backs and then smile in their faces later. Across town, NeNe paid a visit to Porsha, and although it was late in the morning, Porsha came to the door with her hair still wrapped in a scarf, and last night’s makeup still on her face. Everyone knows pregnancy is exhausting, but it’s still the early days in Porsha’s pregnancy, and NeNe wondered if she’d even still be bathing by month six or seven if she kept going at this rate. She was hopeful, however, that Porsha and Kandi would be able to slap smiles on their faces and fake their way through the trip to Tokyo, following their own hibachi night blow up. When it was time to go wheels up, the ladies were pretty excited. Tanya and Marlo showed up wearing all their labels, Eva and Cynthia showed up with WAY too many braids, and NeNe was just excited to have a Gregg-free trip with the girls. Things were off to a pretty good start. Porsha and Kandi even exchanged fake air kisses when they greeted one another, and once they explained to Shamari that it would actually take a good ten hours to get to Tokyo, they were on their way. Of course, things fell apart pretty quickly once they arrived. Upon landing in Tokyo, they quickly realized that Marlo’s bags hadn’t made the trip–not that the rest of them didn’t have enough luggage to outfit all of Asia. Also, none of them bothered to learn a word of Japanese other than “Konnichiwa,” which they said constantly–about everything. After a moment of silence for Marlo’s lost luggage, Porsha showed off her new Dennis-themed ink, which was actually just a series of symbols: a heart, a cross and a dollar sign (yes, it’s a classy tattoo), and Kandi thought it was quite wise of her not to actually have his name tattooed on her neck. Eva thought it looked like a bunch of emojis. They were both right. Either way, Porsha is still beaming ear to ear over her new man (for now). Dinner presented yet another issue. Charcoal shrimp tartar, though? I can’t really say I blame them. When you finally arrive, starving and exhausted following a long trip, it’s not exactly the time to have an adventurous meal. But they would all have to find a way to adapt to the many cultural differences, and the food was the least of it. To that end, Tanya hired a woman named Aya to be their cultural guide. Not a bad idea, considering Eva had once been arrested in Japan while on a trip back in her modeling days. Somehow, a cultural misunderstanding had led her and the other models to be mistaken for prostitutes! I’m not exactly sure how that could happen, but then again, I don’t think I really want to. Anyway, Aya explained that the first rule of Japanese culture was being punctual, which is no easy feat for this crew, and everyone knew they were bound to offend people left and right. After the short lesson on Japanese culture, Eva toasted to everyone and thanked them for coming along on the trip to celebrate her upcoming wedding–and for overlooking the fact that she’d neglected to invite them on her first bachelorette trip to Miami a few months before. She thought it would be a good idea for everyone to clear the air and dispense any unpleasantness before they went any further, and she announced that she’d start the ball rolling by addressing her issue with Porsha. Eva said she liked Porsha and had thought they were becoming friends but was disappointed by the way Porsha had ‘thrown her on glass’ and assassinated her character by calling her out about the things she’d said about Cynthia. But Porsha wasn’t having it. She said that Eva needed to quit “playing the victim” and denied “stunting” on her because of everything Porsha said had been true. Furthermore, she said, it wasn’t just Cynthia she’d shaded. Porsha pointed out that Eva had made nasty comments about Shamae too, and had turned around and smiled in her face later, and she needed to own up to those things. Cynthia agreed and before long, Marlo got in on the act too. She said that she’d heard Eva had talked about her “like a cat” (i.e. worse than a dog) and she’d been shocked because Eva was always texting her, and was as sweet as a pie when they were face to face. Eva largely denied these claims, but everyone knew the truth, and before long, they simply let the matter lie. Luckily, Kandi refrained from discussing her own issues with Porsha–they’re only going to be in Tokyo for a week, after all–and Porsha pulled NeNe aside to help announce her pregnancy to the rest of the ladies, which she did, much to the ladies delight. As the sun rose on the second day of the trip, Eva got some devastating news: her grandfather had suffered a heart attack and was mistakenly put on life support, despite having a Do Not Resuscitate order in place. The prognosis wasn’t good, her mother had explained when she called, adding that it was quite likely that she’d be calling her later to tell her that he’d passed away. Eva was heartbroken and went to Kandi’s room in search of a shoulder to cry on–and some leftover champagne–and she left feeling a little better. A little later, the ladies set off for a day of sightseeing with Aya, and most of the women managed to arrive on time, although NeNe, Shamari, and Marlo were more than 30 minutes late, and were nearly left behind. But, at least, Marlo had a good excuse. Without her bags, she was left with no underwear and no glue to tack down her wig, and being creative takes time. When they arrived at their first stop, a temple, Aya cautioned them to be “demure.” Well, this lady really is asking a lot! First, she wants them to be prompt, and now she wants them to be quiet and ladylike?! Konnichiwa! But the ladies actually managed to control themselves, as they first read their fortunes, and then entered the temple to pray for their families, including Eva’s grandfather. But all the good behavior went out the window when they sat down for dinner. This seems to be where things usually fall apart for the women. Perhaps they should fast..or maybe just eat alone. Anyway, Porsha and Tanya were discussing her fiancé, Paul, whom Tanya said she shared a “spiritual” marriage with, rather than a legal one. But for some reason which wasn’t quite clear, Porsha felt that maybe they actually were married, and simply hadn’t told anyone yet. Tanya wondered why in the world she would possibly hide her marriage to the man she was engaged to and shared her home and her life with, and she was also curious about another thing: why did NeNe always seem to be making snide comments about their relationship? At the temple, when they had been reading their fortunes, and Tanya had revealed that she’d be getting married, NeNe had wondered aloud if maybe she’d be marrying someone other than Paul. What exactly did she mean by that, Tanya demanded to know. NeNe was in no mood to explain herself. She said that she didn’t care enough about Tanya or Paul to shade their relationship. She said she didn’t care if they were already married, getting married, or never got married, and advised Tanya to quit while she was ahead. It was beginning to turn nasty–and as you can imagine with anything involving NeNe, it’s only just begun. Stay tuned!